At the time of this writing, there are 111 lots selling in the sale. These lots consist of 80 bred heifers, 29 bred cows, and 2 cow-calf pairs. All females selling are less than five years of age at sale time. 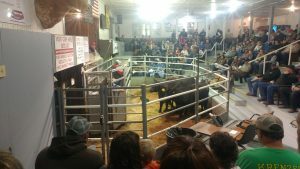 You can use the direct link to the Replacement Female sale page at the Ohio Cattlemen’s Association web site that is: https://www.ohiocattle.org/events-programs/replacement-female-sale . At that page, there will be several items of interest regarding the sale. First, you can click on the link “View the sale listing” which contains breeding information on the cattle selling. Second, you can click on the link “View the consignment videos” to watch short videos of the cattle being offered in this sale. Take advantage of this opportunity to add quality and quantity to your herd. If you have any questions about the sale, you can call me at my cell phone at (937) 763-6000 or email grimes.1@osu.edu . Posted by Smith at 5:07am November 21, 2018 Posted in Events. Bookmark the permalink.